Super Bomberman R released for the Nintendo Switch, March 3rd, 2017 by Komani Digital Entertainment. The story starts off with the evil Emperor Buggler waking up the Five Dastardly Bombers to control the five planets of the Starry Sky Solar System. 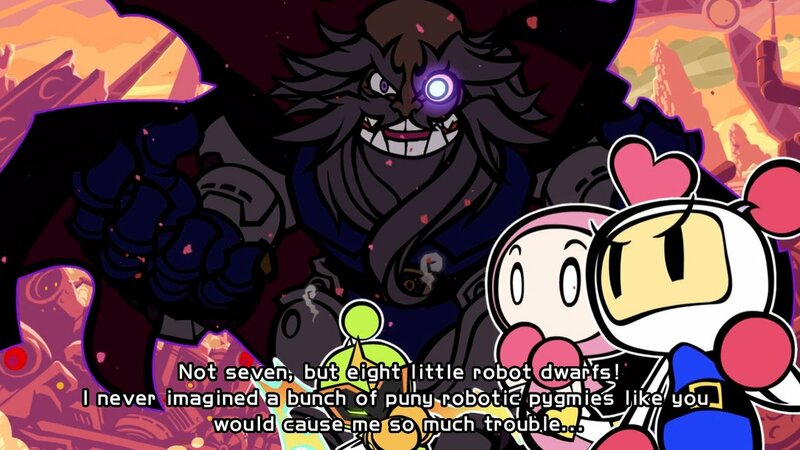 After that scene with Emperor Buggler giving us his plan, White Bomber is back home with his seven brothers and sisters and tries to motivate them for some training, but each sibling declined until Emperor Buggler takes control of the TVs and tells the entire planet of his evil plan. White Bomber didn’t want to sit by and let it happen so he took all seven of his siblings with him on the quest to defeat the Five Dastardly Bombers and Emperor Buggler to save the universe. 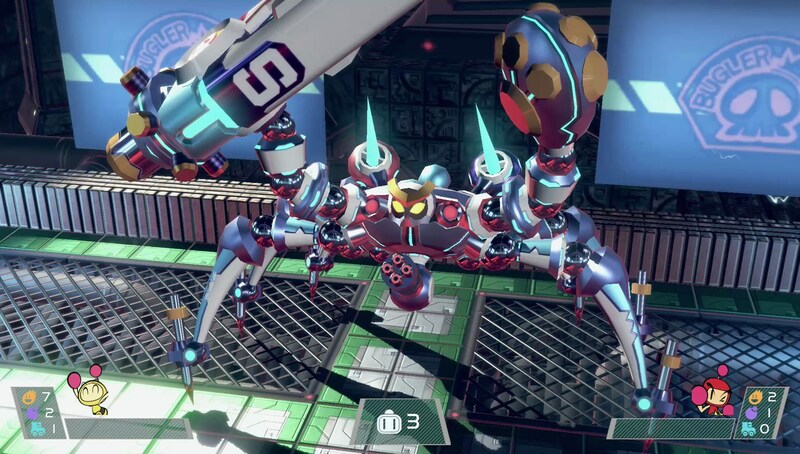 When the game starts, there are two game modes, Story mode, which is single-player and two-player co-op story with 6 worlds more than 50 stages and the Battle mode where you can play with up to 8 players and it’s a lot easier for beginners to play as well with the 2D grid platform. The last bomber standing is the winner of the game. I’ve played only in single-player and the boss battles are a little tedious but the stages are pretty easy. You have missions to fulfill, which is destroying all the enemies or collecting keys to move on to the next area. Also, the items are extremely helpful and you can get them by destroying the blocks and the enemies around you. Overall, this is a really fun and cute game and to beat the stages, you just gotta know to dodge your own bomb routes else you’ll die a lot like I did. The soundtrack has an electronic, futuristic feeling and I love the graphics. It’s so fluid. 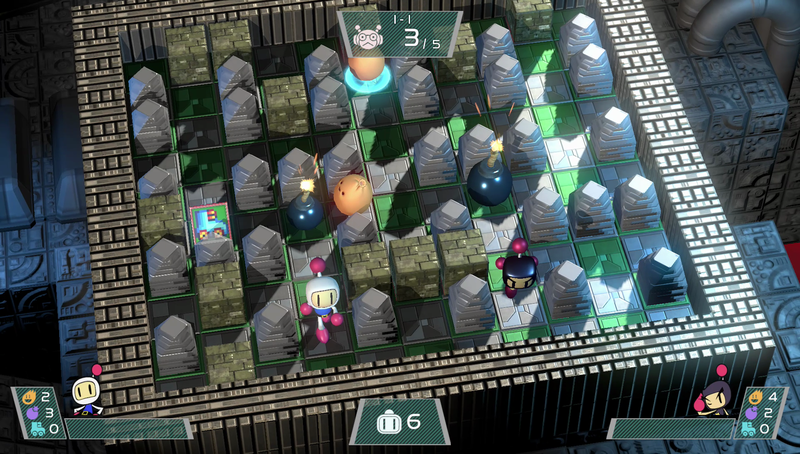 I know it’s been many, many years since I’ve played a Super Bomberman game (I think since Bomberman World for the Playstation back in 1998) and I feel good playing a new Bomberman game for the Nintendo Switch. It really brings me back to the old days. 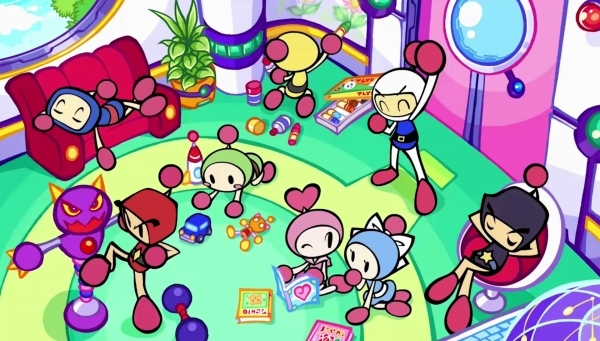 Have you guys played Super Bomberman R yet?